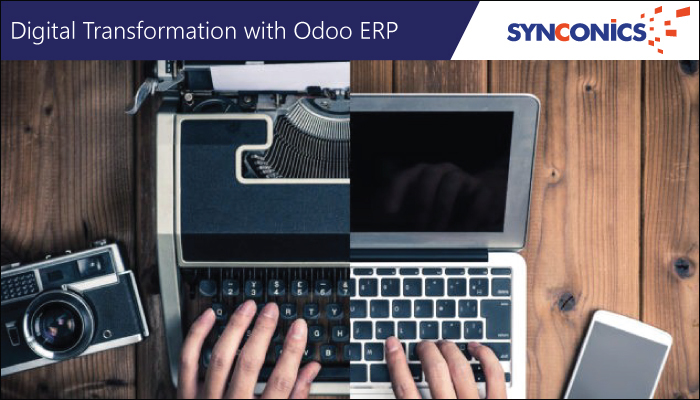 Digital Transformation with Odoo ERP | | Synconics Technologies Pvt. Ltd.
Digital transformation is the use of technology to make resourceful improvements to an organization. It is more than a simple technology initiative and is instead a strategy to completely overhaul an organization’s business model. Digital transformation with ERP may provide Business process reengineering: specialized software (Best breed System) focus on incremental improvements to business processes – such as finding more efficient ways to perform existing functions. Instead of incremental improvements to business processes materially disrupt and improve current business models. ERP benefits digital transformation with breakthrough to business models, can provide better data and functions to more efficiently get products to customers, can materially change what products are delivered and how they are delivered. True business process reengineering is enabled only by digital transformation. More specifically, these initiatives find ways to leverage innovative technology to provide better products and service to customers. In order to become a Digital Enterprise which is a must now, organizations need Digital Core to participate in a Digital Economy. In a Digital Economy, a very real currency is the data exchanged between entities, not just goods, services and monetary funds in the traditional sense. You need to look no further than the Financial Services “economy” to get a quick look of what your industry will shape-up in a very short period of time. Digital Enterprise: Transforming your business from analogue to digital. Organisations that believe that they don’t need to rapidly evolve. They will die. Organisations who choose believe that digital “elements” of their business (like a CRM product) will somehow make them a digital enterprise. These companies will not be competitive and will either suffer significant devaluation over the next decade or will be acquired. Organisations who know what the coming Digital Economy for their respective industry will require to win and are earnestly building a Digital Core, connected all the way to the Digital Edge of their business and beyond. These companies will win with change management. Final and most important point, the need for a Digital Core, connected to every part of your business all the way to the edge and beyond. 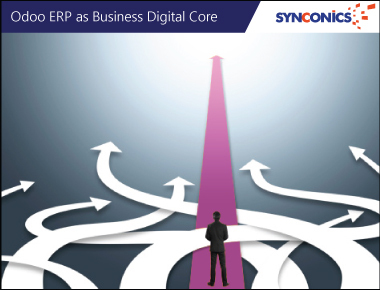 Odoo ERP offers a Digital Core for your business. appreciate how this works, you first need to think of Odoo ERP as a platform, a Digital “operating system” for your whole company that enables your business to consume everything happening in and around your business in real time. Not just transaction data, like what you sold today, but the context around the transaction, like what someone said about the purchase. All of this, beautifully intermingled into one platform. That way you aren’t spending valuable investment money on integrating data, you’re investing those money on ways to connect with your customer in the moment and, ultimately, sell more. As indicated earlier, that Digital Core must be connected with the rest of your business. Odoo ERP happens to have a solution for that as well. It’s a new suite of business apps that reduce process complexity and digitize all the antiquated, analog parts of your business. 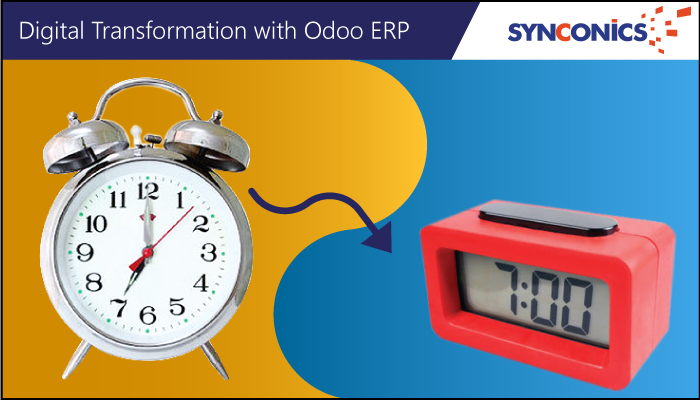 Odoo ERP in turn is integrated with a powerful set of applications that enables your business to connect directly with your customers (Customer Engagement and Commerce), suppliers, employees and departments. To sum it up, we have encompassed it all – a true digital enterprise that is greatly simplified with LESS technology that indeed does much MORE with complete and comprehensive framework. We truly believe that Odoo ERP can be the single digital core for your business and that is the reason we are moving every application to run on this new, singular platform. With core capabilities including reporting, analytics, dashboards, planning, scorecards and more, companies can understand performance and make better decisions. With trusted, accurate and timely information to the right decision-makers at the right time, organisations can optimize business performance. Our goal is clear – enable your organization to become a Digital Enterprise that is simple, agile and responsive. The road to the Digital Enterprise has an on-ramp waiting for you, and that on-ramp is called Odoo ERP. 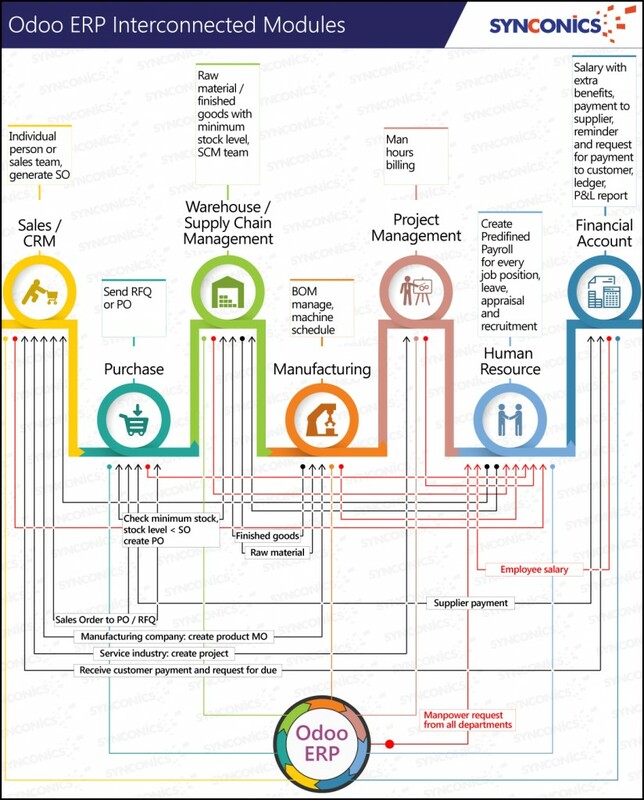 Conclusion: Digital transformation with Odoo ERP is most suitable for organizations that are aggressively pursuing growth, experiencing tectonic shifts in their industries, and/or are interested in overhauling their business models to be more competitive and get maximum ROI on ERP implementation. Do write to us on: contact@synconics.com or Skype: synconics.technologies to know and understand the tools and systems required to build, host, operate and how to adopt/adapt the Digital transformation service.